Can it be that I’m dreaming or did I wake up one morning and become part of a black and white movie. You may not think about color as it totally surrounds you each day but at this time of the year in New England, I sometimes feel that winter is like living in a black and white world where there is very little color other than various shades of gray. I look out my window and see a black and white landscape. A blanket of snow covers the ground and is a stark contrast to the dark tree trunks of the apple trees in our orchard. The evergreen trees dark green needles are covered in a thick coating of snow that looks like whipped cream. Sticky white snow sits on rooftops, fences and clings to everything. Long, colorless icicles form cages over the windows and restrict the light that comes through them on a gray, cloudy day. I don’t mind winter’s cold and the snow makes everything beautiful on a sunny day when the bare, icy tree branches sparkle in the wind. During December, we are all hoping for a white Christmas with just enough light, fluffy snow to make our world look like a greeting card. By February, most of us are hoping that the snow piles will soon start to melt and that we will see the first green shoots peaking through the snow. The days have now started to get longer and spring is just a couple of weeks away. Unfortunately the gray days of winter are not over and the forecast is for another foot of snow to be added to what is already on the ground. This is when travel plans are made to head south to Florida to visit family and friends and to once again spend time in a world full of color. Even though you may not live in a part of the world where winter turns the landscape into a black and white portrait, I’m sure you experience a some gray days. I hope you will find a way to bring a little color into your life on those days when the sun is hiding behind the clouds. NOTE: I have added this note to let my readers know that the above photos are taken in color and have not been adjusted to black and white. On a cloudy day, this is the way the landscape looks. If you blowup any of the photos, you will see slight colors in each one. This entry was posted in Uncategorized and tagged black and white, Home, Nature, New England, photography, snow, travel, winter. Bookmark the permalink. Lovely photos, Karen. We had a touch of spring here in London last week with sun and warmth but now winter is back with grey and freezing temperatures. It will be nice when we finally make it into spring. Thank you for your compliment, Kay. I’m glad you enjoyed the photos. We are forecasted to have another 6 to 12 inches of snow over the weekend. Yes…it will be nice when spring weather finally arrives. Thank you Mandy, I’m glad you enjoyed the photos. I hope you have a lovely weekend as well. Very nice! Beautiful pictures and prose! Hi Joanne, I’m glad that you enjoyed the post and photos. Thank you for your lovely compliment. I am suffering winter fatigue. Winter has a special beauty of its own but I can’t wait for the long warm days of summer to arrive, and beautiful produce along with it. Hi Karen, I can certainly agree with you. This is the time of year that we are so looking forward to warm days, sunshine and produce from our gardens. Our cottage in Maine is buried in so much snow right now that it is hard to imagine planting tomatoes there the end of May. This is just beautiful! Snow and ice are nature’s master redecorators and composers of perspective! Thank you Natalia, for your lovely compliment. I love your way of thinking about the winter scenes that nature creates. I am looking at very familiar landscape photos. The forecast is for another winter storm this weekend, that will be 3 weekends in a row. Snow on top of snow, I hope all this white disappear before spring arrives. Your photos are beautiful, love the “Icicles Cover The Windows”. Hi Norma, The first part of our winter was a piece of cake but there is a lot of snow piling up now. We are suppose to get 6 to 12 more inches this weekend. I’m glad that you enjoyed the photos. I like the icicles too…those form at my bathroom window where I’ll be starting my seeds next month. Your photographs are so very beautiful. I know you must tire of the the endless snow and ice; however, here it has been in the 80’s much of February and a bit of cold or snow or ice would kind fo spice things up a bit for us. …..but only a day or two!!! Thanks for sharing the photographs there are magnificant. Enjoy your trip to Florida. Thank you Tin Man, for your nice compliment. I’m glad you enjoyed the photos. The snow is beautiful…especially since we are in the country where it stays white. This is the time of year though when I’m looking forward to some warmth and for the snow to start melting. I’ll bet you are! It has been a long, long time since we lived in an area with true Winters and I remember the longing for Spring, sunlight and flowers…..soon!!! Thank you Gourmantine, for your lovely compliment. We all want our snow for Christmas but certainly tire of it at this time of the year. It will be a long time for the piles of snow from plowing to melt. I’m looking forward to spring weather. I hope you have a nice weekend as well. It’s the grey days I don’t like.. I love winter..with the brilliant blue skies white snow(snow much this year) it’s the bitter cold and winds I don’t care for..and both have been in abundance..
Hi Monique, I’m glad that you enjoyed the photos. I agree with you about when the ground is covered in snow and there is a deep blue sky with the sun shining…there is nothing prettier. I’m wishing you sunny days! There is a certain beauty in the stark gray and white days of winter, as your pictures show. But I long for the days when the sun comes out and transforms this world into a sparkling showcase. We’ve been lucky here in London, Ontario to have had an unusually sunny February; but more freezing rain and snow is forecast for later today and it’s quite gloomy here. I have a beautiful bouquet of cut flowers — pink and white and green and purple –sitting on my living room table so I can enjoy a little bit of spring each time I glance at them. I agree though, a trip to sunny Florida is a great idea right now! Hi Marlene, There is beauty in the starkness that gray days create with the snow but I’m like you…I much prefer the sun making the snow sparkle. Unfortunately, your freezing rain and snow will arrive here tomorrow. Hi Angie, Cold, winding and more snow on the way. I’m looking forward to spring weather. Hi Karen, Oh I appreciate those black and white winter days from when we lived in Syracuse! Your pictures are lovely, even in the grayness. I hope your time down south is sunny and warm(er)! Hi Dana, Our winter started off with just dustings of snow but we certainly have been receiving more than our share lately. Thank you for your nice compliment and wish. Seeing those icicles makes me shiver, Karen. Snow makes such a mess and makes drivers do crazy things, but it is so beautiful as it falls and turns everything into a wonderland. We have plenty of grey days here and always look forward to the first color of spring – usually the daffodil shoots that should start appearing any time now. Hi Cathy, One wonderful thing about living in New Hampshire in the winter is the great way our roads are taken care of. Everyone comments that our roads are better kept during the snowy winter than anywhere else. I’ll be looking forward to the first daffodil opening this spring but it will certainly be a while. That’s the beauty of living in the country, our snow is already black and oily from the dirt of the city. Gorgeous photos Karen, but I must say I am so over it, bring on the spring! Hi Eva, You are right…the snow stays white when you live in the country. I’m glad that you enjoyed the photos. We have more snow through the weekend and again in the middle of the week. Spring can’t come too soon as far as I am concerned. Thanks Karen for your comment on my post,. spring is certainly on it’s way in my neck of the woods so I hope spring comes for you soon or you manage to get away to warmer climates.. Grey or black & white days certainly make you feel grey inside..maybe you could fill the house with fresh flowers. Hi Barbara, I enjoyed seeing the signs of spring on your blog…ours appear much later but will certainly be welcomed when they arrive. Fresh flowers and colorful meals brighten the gray days for me. Thank you for your nice comment. I find february to be a transitional month and most of us want the spring/fall to start appearing. Have a great weekend Karen! Hi Paula, You are right about February being a transitional month. As the northern hemisphere starts to warm up. the southern hemisphere is starting to cool off. This is the time of the year when the foods we enjoy tend to similar. Thank you for your comment and have a nice weekend as well. Hi Karen, I am so behind in reading your blog and looking at these snowy photos reminds me how much I miss it. As always your photos capture moments for your readers to enjoy! I also love your posole recipe – and you are so right….you can’t take Texas out of a girl! Thank you Linda, for your very kind words. I appreciate your being a loyal reader and look forward to whenever you have the opportunity to stop by. It is nice to know that your enjoy my posts and photos. Gorgeous. Absolutely gorgeous. I can appreciate the beauty of it all, but have to admit that warmer climes suit me better. Here in Central Mexico, this is the strange year where we just didn’t have a winter. So mild it is freaky. So many flowering plants and trees are already in full bloom. Yet the stillness of your photos and the regal beauty of it all, does speak volumes. Thank you Victoria, for your lovely compliment. I’m glad that you enjoyed the photos. There truly is beauty in winter…whether it is the shades of gray on an overcast day or when the sun shines and makes it look like a winter wonderland. I really like your shots Karen, especially the icicles – reminds me of the houses where I grew up in northern WV – my grandmothers house next door got some really long ones. Hi Larry, I’m glad you enjoyed the photos. It is amazing how thick and long the icicles can grow…they are beautiful when the sun shines on them. I’m happy that I brought back memories of your grandmother’s home. Thank you for your nice compliment. Hi C.L., Thank you for stopping by for a visit and your nice compliment. I’m glad that you enjoyed the photos. Thank you Ray, for your nice compliment. I’m glad that you enjoyed the photos of winter here in New Hampshire. It can be very beautiful even on a gray day…when the sun is shining it sparkles. Here in Colorado, winter is mainly brown and dull, the black, white, and grey of snowy days are a welcome change as we are desperate for moisture out here. However, I had the opportunity to visit Phoenix a couple weeks ago, which was also brown, but the sun was so warm on my skin and my bare toes in sandals, it was the break from winter I needed. I didn’t even realize how much I needed it until I was there. Hi Judy, It is so interesting to learn what winter is like in different parts of our country and the rest of the world. It is nice to be able to have a little break from the cold…I’m glad you got a chance to get away and have a little warmth. We’ve had very little snow the last two years, but just had 5 inches last night. Not much by New England standards, I realize, nor even in the Midwest (I’m in St. Louis); but when you’ve had no more than an inch for ages, 5 inches seems like a lot (particularly when one gets to shovel it!). It’ll be in the 40s in a couple of days, though, so it’ll soon be gone. I really do love the look of a snowy landscape. All the shades of grey look wonderful when rendered in black and white photography. They look great in person too, of course, but they’re so much more dramatic when all color is removed. I don’t much miss film, but I could be persuaded to shoot Tri-Xagain (is it even around anymore?) just for its lovely granularity — perfect for rendering show scenes (and wonderful for portraits, too). It’s hard to get digital to recreate that look. Anyway, I’m rambling — snow tends to do that to me! Good post, great pictures — thank you. Hi John, Five inches of snow is a lot when you are shoveling. We are supposed to get between 6 and 12 inches of heavy wet snow over the weekend as well. I have added a note to my post because of your comment. The photos in the post were taken in color with my digital camera and were not altered to be in black and white. If you look closely at each photo you will see little bits of color. When it is a very overcast day, what you see in these photos is what I see in person. Winter skies create a landscape of different shades of gray. It is one of the reasons I enjoy our yellow house. 🙂 Thank you for your very nice compliment…I’m glad you enjoyed the post and photos. Hi Nia, I’m glad that you enjoyed the photos as you take such wonderful ones yourself and I appreciate your lovely compliment. Yes, spring will be here soon and I’m looking forward to it very much. Have a great weekend as well. Oh you are so clever dear Roger…you have given me my laugh of the day. Thank you for your comment. I hope you and Jenny have a lovely weekend as well. For me the best thing about snow is finding that outdoor spot and just letting the silence embrace you – love that:) Happy Friday! 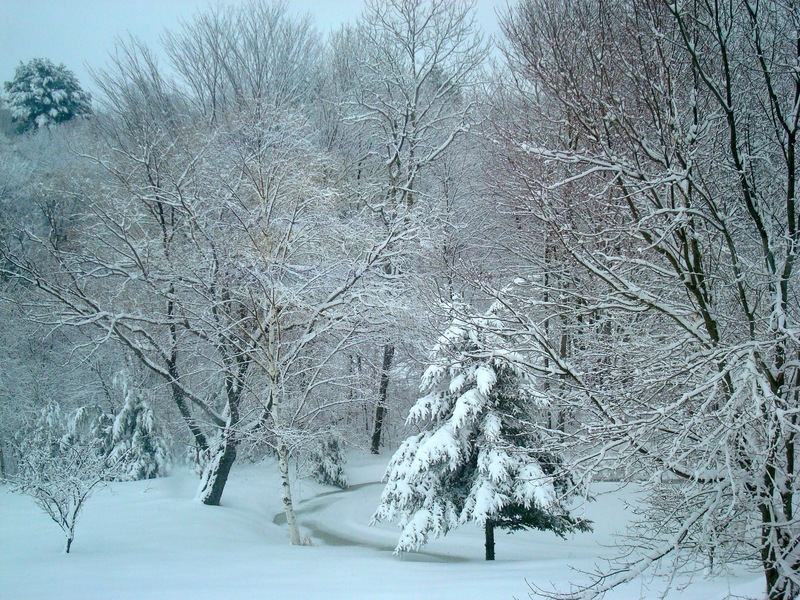 Hi Renee, I agree with you…snow does soften the sounds of the world around us. Thank you for your nice comment and wish. Have a great weekend. Brrr… It never gets this/too cold where we live (never gets too hot either). I guess that is why we live where we live (SF Bay Area). Beautiful scenery, and beautiful photos. 😀 Fae. Hi Fae, The San Francisco Bay area does have lovely weather…and you don’t have to deal with snow. I’m glad that you enjoyed the photos and appreciate you nice compliment. Wow – those icicles are amazing! Hi Caroline, Thank you for stopping by for a visit and your comment. I’m glad that you enjoyed the photo of the icicles. Absolutelt stunning – even black and white are beautiful colours! Thank you Tanya, for your nice compliment. The stark contrast of the trees against the snow on a gray day is lovely. I look at the black and gray and white season as lessons to really really appreciate and understand color, teaching the eye to understand colors in terms of hue (color), value (light to dark), purity (tints, tones, and opposite mixtures). It’s an opportunity to explore the colorful grays and fine distinctions that make the more pure colors really sing! Thank you Mater, for your lovely comment. I think the first photo is a good example of what you are talking about…you are so correct in your observations. Gorgeous photos Karen. I know it’s cold but oh, so beautiful. Thank you Bonnie, for your lovely compliment. I’m glad that you enjoyed the photos. It is cold but hopefully the warmth of spring is not too far away. Hi Mad Dog, We do have lots of snow and more coming over the weekend. I’m glad that you enjoyed the photos and appreciate your nice compliment. Thank you Uru, for your nice compliment. I’m happy to know that you enjoyed the photos. Hi Charlie, Living in a winter wonderland is beautiful but you are right…I’m now looking forward to when the snow stops and green shoots herald the beginnings of spring. More gorgeous pictures, Karen. I stay out in the cold and grey as briefly as possible but it’s lovely to be able to look at the snow and ice from the comfort of my warm home or on my computer monitor. We had a very small dump this morning with a lot of moisture in it. I’m debating on having it shovelled … like all my neighbours who were home today, or wait for the predicted freezing rain to melt some more of it. Thank you Boleyn, for your nice compliment. I’m glad that you enjoyed the photos. I move a lot quicker when I’m out in the cold and enjoy when I’m back in the warmth of my home. We are supposed to be getting another 6 inches of snow over the weekend with more in the middle of the week. I’m glad you enjoyed the winter landscape photos, Gary…thank you for your nice compliment. I do know that you enjoy the warmth and humidity that you experience in Australia. New England would definitely not be your cup of tea. Those are gorgeous photos Karen. Thank you Anne, I’m happy that you enjoyed the photos of my winter landscapes. I appreciate your nice compliment. I don’t think I’ve ever seen icicles like that before! They’re huge. Not even where I grew up (and there could be much colder than where I now live) weren’t that size. Seriously, I guess it must be very cold where you are right now. Hi Johnny, Would you believe that sometimes the icicles are twice as thick as these. We have had some cold weather…February averages (F) are the mid 30’s for highs and the teens for lows. What glorious photos even if the middle ones again refused to print out. [Methinks my computer may be trying to tell me something about retirement!!] Love black and white . . . thank you for sharing! I too live in a black and white world at the moment as the northern 2/3 of the state is getting punished with another storm of record rains and winds over 130 kms/hr in places. How to tell nature: ‘enough already’!!!!! Hi Eha, Thank you for your lovely compliment on the photos that you can see. I’m so sorry that you are still having trouble seeing the photos in my posts. If it is a problem with other readers, hopefully they will let me know. It sounds like you are having terrible weather. We have more snow coming so I totally agree with you…”enough already”. My vacation to Key West only made winter feel more harsh! But it was worth it. I am from New England so I understand just how barren but beautiful winter can be. Hi Rachel, I’m glad that you enjoyed the photos of our New England winter wonderland. I know what you mean…it is hard to go from cold to warm weather and then return to the cold. I enjoyed following your trip to Key West. My husband and I used to live in Key Largo and we loved driving the 100 miles down the overseas highway and spending a couple of days in Key West every once in awhile. I love winter landscapes and your photos are wonderful. Keep on the look-out for a similar icicle photo on my blog in the near future. We have seen some doozies this year. Hi Heather, I’m glad you enjoyed the winter landscapes. Many times during the winter, the whole roof is lined with icicles. They are so beautiful when the sun shines on them. I’ll be looking forward to your photos. Thank you Judy, for your nice compliment. I’m happy that you enjoyed the photos. Our home is a winter wonderland at this time of the year. Love your description of the icicles…they do look like glass. Hi Smidge, I’m glad that you enjoyed the photos…I appreciate your lovely compliment. You are probably right about the white snow being be prettier than a brown landscape. On the bright side, your brown grass will soon turn to a beautiful lush green before too long. Black and white, to be sure, Karen, but there’s a real beauty to the landscape when it’s like this. Your photos captured it well. And the silence that follows a snowfall? Magical. I agree with you John, there is a real beauty in the starkness of the winter landscape. I’m glad you enjoyed the photos…thank you! Hi cquek, Thank you for stopping by for a visit and your nice compliment. I’m glad that you enjoyed the photos. I’m glad you enjoyed the photo of the icicles, Tandy. It is snowing now and will last through tomorrow…about 6 inches. At least it is not the three feet we had two weeks ago. Thank you for your nice comment. Karen, I always love your beautiful pictures and in this post, I loved your beautiful words. What a wonderful description of winter and I could relate from the South that isn’t so sunny this time of year. I sometimes think the best thing about February is the fact that it is a month with only 28 days. Thanks for sharing your world. How beautiful is the simplicity of black and white! You certainly got far more than a dusting! Those icicles look extraordinary! Hi T.W., Thank you for your nice compliment. I believe nature is a great decorator. Even though I’m not crazy about gray days, they do create a beautifully stark landscape where everything appears to be in black and white. The same photos on a sunny day would look so different. In the last couple of weeks we have had over four feet of snow and we are getting another 6 inches this weekend. I’m glad you like the photos, Lea Ann…thank you for your compliment. They are predicting another 6 inches or more for us as well this weekend. I certainly don’t mind the snowy days either. I look forward to winter because that is when I get some of the nicest photos. Your photos show why. Just beautiful. Hi Donna, I’m happy to know that you liked my winter landscape photos. I enjoy living in New England because of the four seasons we have here. I agree with you that the snow is a wonderful background for your beautiful photos. Hi Donna, I’m happy to know that you liked my winter landscape photos. Thank you for your compliment. One nice thing about living in New England is that each of the four seasons are beautiful. I agree with you about the snow being a great background for photos…I always enjoy yours. Hi Karen – I’m so glad you stopped by my blog, because that is how I found yours. I love your recipes and will be checking them out [I’ve been working on perfecting a banh mi lately too for eventual inclusion on my blog]. And though as a gardener, I cherish those green summer months, the monotones of winter always draw me in and have me out there with the camera. You can pick up so much texture and detail in the winter – your shots are lovely! Thank you for stopping by for a visit Donalyn…I appreciate you nice compliment. I’m glad that you enjoyed the photos and I look forward to your return visits. Such striking compositions they make, Karen. Specially love the icicles, but I know that I wouldn’t if they were dangling outside my windows. I’m trying to appreciate the drab colours of winter, but it’s an effort. I’m such a sunshine craver. Thank you Jo, for your nice compliment…I’m happy to know that you enjoyed the photos. We have a lot of gray days during the winter…you just have to try and find the beauty in them. It is one of the reasons that I have a yellow house, it is my sunshine when there isn’t any. I think we are all alike and love sunny days. We have many “black and white” days…but fortunately the sun has been making an appearance more often now and so the color landscape comes to life! Fortunately it won’t be long before spring! Hi Laila, I’m looking forward to more sunny than gray days. We are fortunate that spring is fast approaching. I appreciate your nice comment. Once I retire I hope to travel during the gray of January and Feb., especially Feb as it is the grayest of months…these are beautiful photos. Hi Donna, I’m happy that you enjoyed the photos of my winter landscapes. The nice thing about traveling during the grayest months of the year is that there aren’t a lot of tourists. The bad thing about traveling during the grayest months of the year in New England is the snow…you never know when there will be a blizzard. I wish you safe and memorable travels. Thank you Afra, for your lovely compliment. I’m glad that you enjoyed the photos of my winter landscapes. We are lucky to live in a rural area where there are acres of land that stay pristine white. What a gorgeous photographs!!!! We did get to experience this about 7 years ago here in Albuquerque. We got 18 inches in 12 hours and you’re right – everything was black and white. When our beautiful blue skies returned a couple of days later we still have 18 inches of snow, we all of a sudden got a burst of color – baby blue skies and white. It too was gorgeous! I love all of your photos but the first one definitely caught my eye with the different shades of gray and the blue tint. It does look photoshopped, but I know it’s not because I’ve seen this scene once or twice. 🙂 Gorgeous! Love the image of the icicles. Thank you Jed, for your nice compliment. I’m glad you liked the photo of the icicles…they can be especially beautiful when the sun shines on them. 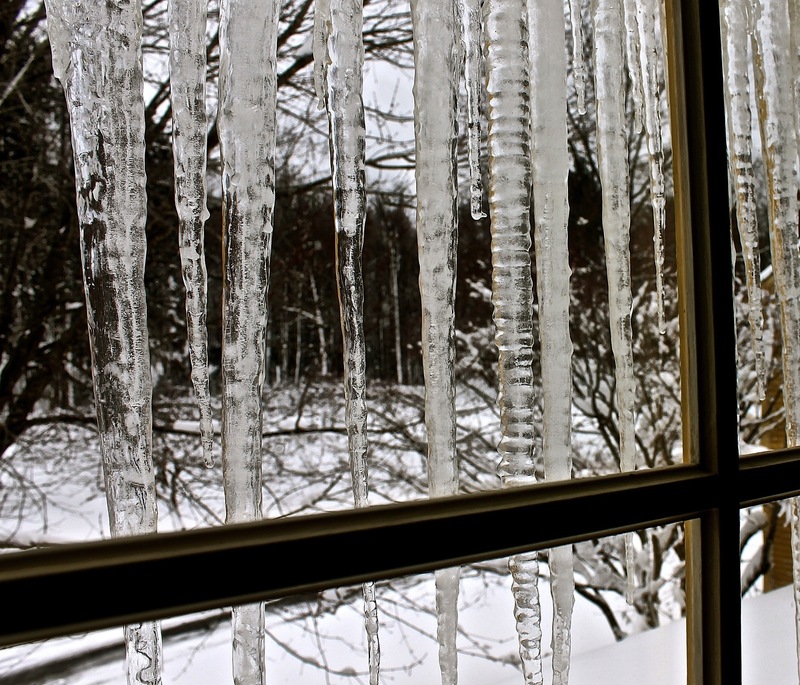 Those icicles are killer…thank you so much for sharing your mad photography skills with us!! Hi Angelia, I’m glad that you enjoyed my photos of winter in New Hampshire. I appreciate your kind words…they are very much appreciated. Amazing photos, love the icicle shot. The snow is too much for me, I am counting down the days until spring time. Hi Natalie, I’m counting the days until spring as well. This winter started out easy but I think it is going out with a real bang. Thank you for your lovely compliment….I’m glad you enjoyed the photos. Thank you GG, for your lovely compliment…I’m glad you enjoyed the “shades of grey”. You are right, they are very restful but freezing cold in real life. I am looking forward to the warming sun that comes with spring and the pale green colors that will start to emerge. Your descriptives are very apt. Winter certainly does seem like a black and white movie at times. Hi Jennifer, Thank you for stopping by for a visit and your nice compliment. I’m glad that you enjoyed the post and my thoughts on winter. That’s an amazing observation, but you are quite right, the world in those photos is black and white. Love the icicles. Thank you Suzanne, for your kind words. It is nice to know that you enjoyed my observations about winter and the photos. I appreciate your compliment. Thank you Elizabeth, for your nice compliment. It is flattering to know that you enjoyed the photos. Hi Sharon, Thank you for stopping by for a visit and your nice comment. You are one of the first to see the hidden colors in our winter landscape. I even had to amend the post with the note saying that the photos are in color and not black and white. While we live in a world of grays at the present time, it takes an artist like yourself to see all the muted colors. Hi Laura, Yes…it truly is a winter wonderland. It is snowing softly right now. Thank you for your nice comment. Your pictures are magical and stunning. I love this natural “black and white” feel on all of them. Isn’t nature simply amazing. Looking at the photo made me feels like I’m in a winter wonderland. So amazing. Thanks for sharing these gorgeous picture with us. Thank you Amy, for your kind words. I’m happy that you enjoyed the photos of our landscape. It is snowing again as I write this…our winter wonderland will be around for some time to come. Beautiful Karen… Enjoy your time in Florida. Hi Brydie, I’m glad you enjoyed the photos. Thank you for your compliment and wish. generally I would have thought the landscapes you showed here were beautiful… they surely are but this year I truly had enough with snow and ice… I too want the sun and colors, lots of colors!!!! Hi Barbara, I know what you mean about some winters having way too much snow and ice. At this time of the year when the landscapes are cloaked in white and are beautiful, I can’t help but dream of the yellow daffodils of spring. Hi Zirkie, I’m glad you enjoyed the photos from far away Cape Town. I never tire of the beauty but I do tire of the snow and gray days by this time of the year. Thank you for your nice comment. It is beautiful, but I honestly don’t miss it. Lucky me, I can visit winter then run home to warm! Love your photos, though… thank you! Hi Rachel, I’m glad that you can appreciate the beauty of the winter landscape. Yes, it is nice to be able to visit and then return to your warm home. I’m glad you like the photos…thank you for your nice compliment. Brrrr! I have never seen icicles that big before! Seems like only yesterday we were enjoying the colorful pictures of your summer garden in Maine. Hi Ruth, During the winter, the icicles can grow by inches in a few hours…they never cease to amaze me. You are right about how fast time flies. I’m looking forward to when I can pack tomato plants in the car and head to Maine for the summer. Thank you Tessa, for your nice compliment. I’m glad that you enjoyed the photos. What gorgeous gorgeous images!!! So beautiful a landscape, I just can’t image living in this environment. The picket fence image reminds me of an Ansel Anderson style of image, very contrasty. I am amazed to know that these were not converted to black and white. Hi Gourmet, Thank you for stopping by for a visit and your nice compliment. I’m glad that you enjoyed the photos of the winter landscapes. I had to add the note about the images being in color as so many readers thought I had changed them to black and white. Lovely photos specially those icicles and the forest. Thank you Raymund, for your nice compliment. I’m glad you enjoyed the photos. The icicles seem to be the favorite of most readers. Totally different from your part of the world. Lovely shots of a lovely snowy scene. Personally I’m really partial to a landscape like this….I couldn’t take it for long, but when it comes and illumines all the Shapes of things, it reveals the sorts of details we frequently miss and I’m so grateful to see them! Beautifully done Karen. Thank you Spree, for your kind words. I’m happy that you enjoyed the photos of the winter landscapes. As beautiful as they are…by this time of the year, I’m looking forward to green shoots but I don’t think they will be coming in the near future. Hi Bam, The warmth of Hong Kong sounds so good this time of the year. We have more snow in the future and right now it is the third snowiest recorded winter. Thank you for your lovely compliment and wish…I appreciate it. Things have been a little grey here in Canada too Karen. I have to say that I’m just starting to tire of season now and am looking forward to a little warmth when we head out on vacation. Any tips on food to try in Jamaica? I recall that you were also a fan of the coconut ice cream with kalua in Cancun. Hi Barb, I think we all get tired of the gray and cold weather at this time of the year. I know you will enjoy your time spent in Jamaica. I would say to try jerk chicken during your stay. My husband would recommend the curry, I’m sure. Have a wonderful trip. A lovely selection of images from your home and garden Karen. I know what you mean about grey days, they are the hardest. But how wonderful you have some Florida sun to dream of! Karen, what amazing photography, I love winter pictures, particularly the icicles are very “photogenic” – I really enjoyed your post today! Love those “winter colors”. On a personal note: has my letter still not arrived at your house…that would be too bad because I had included a little s.th. that I thought you would really enjoy in your lovely cooking! If you get a chance, let me know…I actually send two letters already. Now I am starting to be a bit worried. Thank you Andrea, for your lovely compliment. I’m happy that you enjoyed the photos. The icicles seems to be everyone’s favorite. My mail has been on hold at the post office and I picked it up this morning. Thank you so much for your card. Have a nice day as well. Hi Tania, I’m glad that you enjoyed the photos. One thing I can to say is that New Hampshire takes care of our roads better than anywhere I have been. Thank you for your comment. Hi Maiden, Thank you for your thoughtfulness. I appreciate that you enjoy by blog and thought of it for the Liebster Award. Even without much colour, your photos are beautiful, Karen. Thank you Sylvia, for your nice compliment. I’m glad that you enjoyed the photos. Lovely pictures Karen! I am trying to look at the dark and snowy days in a different way. It’s so easy to feel blah during these winter days (and the lack of sunlight does not help)! Soak some extra vitamin D for us while you are in Florida! Hi Ming, I’m glad you enjoyed the photos. I’ll be happy when the sun comes out because the snow sparkles and eventually the snow will melt. We enjoyed our holiday in Florida…I sat out for three days soaking up the sunshine. Thank you for your nice compliment. Look how gorgeous!! It’s such a novelty for me to see snow. After all, a winter wonderland doesn’t happen in most of Southern California unless you live in the mountains! We even hit temps in the 80s this winter. Hi Ducky, I’m glad that you enjoyed the photos. Winter can be gorgeous…I especially love the landscape when the sun is shining on the snow and everything is sparkling. Beautiful photos, Karen! Thank you for sharing them. I miss New England winters…in Seattle we don’t have the black and white, just gray! I remember the enormous icicles that would form outside our windows, sometimes reaching the ground. Enjoy your sun break and time with family and friends in Florida! Thank you Hannah, for your lovely compliment. I’m glad that you enjoyed the photos of our winter landscape. You are right about the icicles sometimes reaching the ground…I haven’t seen any that big this year. We had a wonderful time in Florida enjoying the sun, family and friends…thanks. Hi Anne, Thank you so much for stopping by for a visit and your lovely compliment. I’m glad that you enjoyed the photos of our landscape and that they brought back memories of your time spent in New England. It’s been a long time since I lived in a place this cold. But we get the dark dreary days no less. Nothing that love can’t brighten however! Fun photos Karen. Hi France, I really enjoyed your nice comment. Yes, love definitely brightens our days. I’m glad that you enjoyed the photos…thank you. It’s beautiful to see Mother Nature at the either end of the spectrum for me! Hi Alli, There really is a contrast between the seasons where the two of us live. I’m glad the you enjoyed the post about our winter landspace. Thank you as always for your nice compliment. Beautiful photos Karen. I have lived in Edmonton during Winter before so I definitely understand the black,white and grey feeling! Snow is pretty but can be a much after the first couple of months! Thank you Ali, for your nice compliment. I’m glad that you enjoyed the photos. I agree about the snow being beautiful but it does get to be a little much. It is snowing as I am writing this. Beautiful shots. As much as i love the beauty of winter I am ready to move on into spring! Thank you Jerry, for your nice compliment. I’m ready for spring but unfortunately it is snowing today. Wow, look at those icicles! I’d have a field day… snapping them all off! 😀 I love the photos, especially the first one there. So pretty. Doesn’t everything look so beautiful in the snow all the time? We had a spot of snow a few weeks back but it only lasted a couple of days – it’s positively clement weather these days. Hi Charles, I wish we had some of your lovely weather now. We have more snow coming for the next two days. The first photo by our pond was my favorite as well. Thank you B, for your nice compliment. I’m glad that you enjoyed the photos. As much as I enjoy the beauty of winter, after days of snow I am looking forward to spring. Hi Terra, Thank you for stopping by for a visit and your nice compliment. I’m happy to know that you enjoyed the photos of our winter wonderland. I do hope that you will have the opportunity to spend some quality time in an area that has the snowfall that you are hoping for in the future. What absolutely beautiful photos! I totally understand your need to escape to warmer, sunnier climates after months of this, but I love snow and would exchange that landscape any day with the grey, wet, cold weather we have been having here. Hi NAF, Thank you for stopping by for a visit and your nice compliment. I’m happy to know that you enjoyed the photos of our winter wonderland. I am like you and love the beauty of snow but it is nice to get away from it for awhile when you know that you will have a couple more months of snow, ice and cold. I do have to agree with you about cold and wet days…they can be very depressing. Ahh winter… as I sit here reading with bright sun and a bare backyard, the weather guy on TV is predicting 3-6″ tomorrow. …oh my it is a long one this year…..
Hi Carol, While you have a bare yard, we still have quite a bit of snow in the orchard with just a few bare spots of grass peaking through. The plow went back on the truck this morning. I’m certainly not looking forward to our 10 or so forecast inches of heavy wet snow…I want daffodils instead! That is the truth! I think winter is going to continue right into spring. Your place is really beautiful! Such a lovely woods around you. But I wouldn’t want to change my warm Adriatic climate for that, for sure! I’m a lover of sun, warmth and outdoor living! Hi Adriatic Heart, Thank you for stopping by for a visit and your nice compliment. I used to live in Florida where it was warm all the time but I do enjoy living in a part of the country where there are four distinct seasons.